Stafford and Grad PLUS Exit Interview. Now that you are leaving school, it is important that you review your rights and responsibilities regarding your. 2 Now that you are leaving school, it is important that you review your rights and responsibilities regarding your Federal Stafford and Grad PLUS Loans. Your Master Promissory Notes (MPNs) also contain your Rights and Responsibilities. 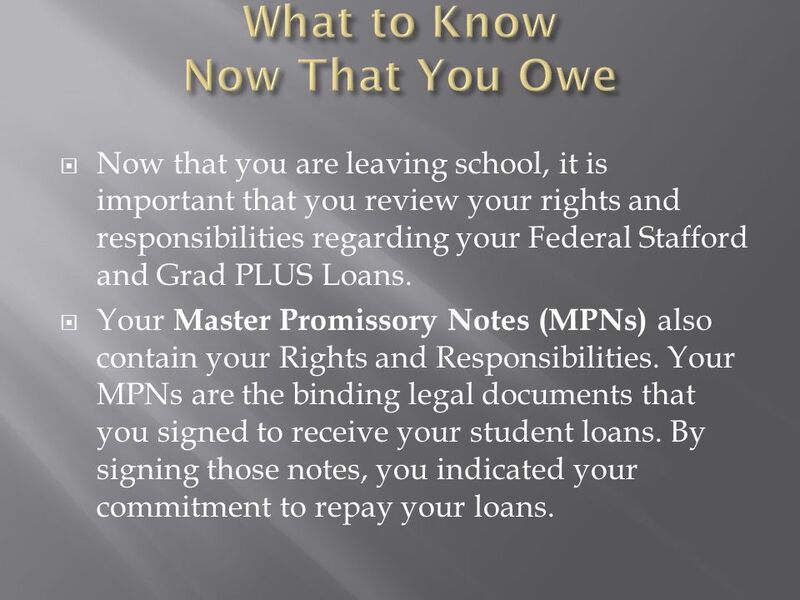 Your MPNs are the binding legal documents that you signed to receive your student loans. By signing those notes, you indicated your commitment to repay your loans. 3 Your MPNs may have been used as a multi-year note if: your school was authorized for multi-year use or you did not change lenders. The multi-year feature of your MPNs is in effect for 10 years from the date of your signature, so if you go back to school, you may not be required to sign a new note. An MPN may be revoked: if you send a written notice to your lender, if you declare bankruptcy, or upon expiration of the 10-year period. 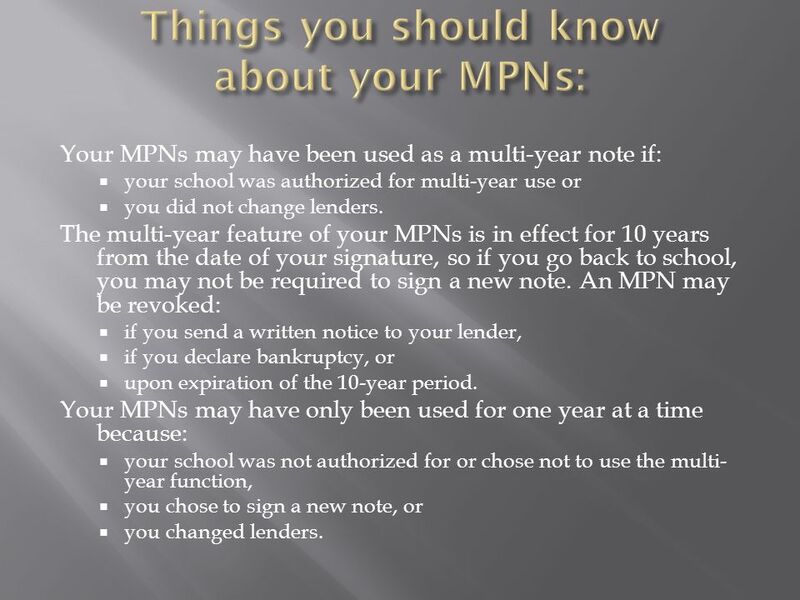 Your MPNs may have only been used for one year at a time because: your school was not authorized for or chose not to use the multi- year function, you chose to sign a new note, or you changed lenders. 4 You must tell your lender about changes to your: name, address, and telephone number. 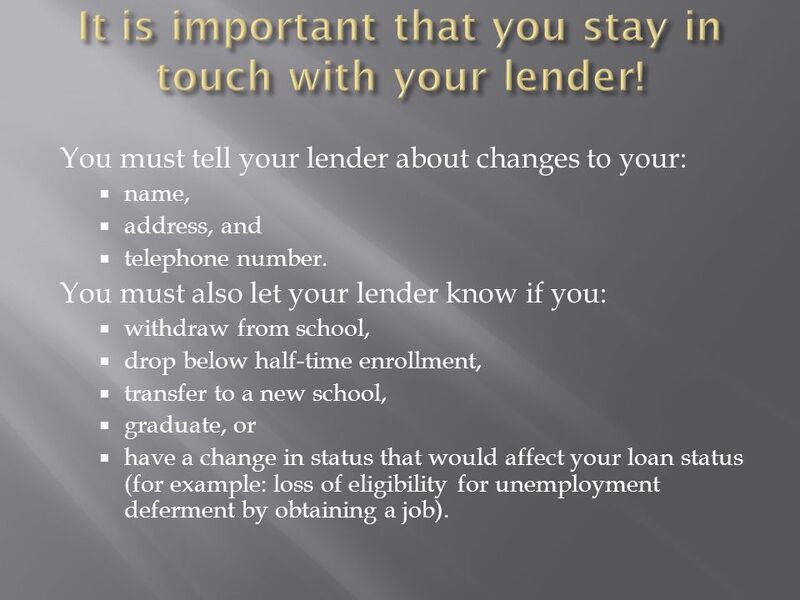 You must also let your lender know if you: withdraw from school, drop below half-time enrollment, transfer to a new school, graduate, or have a change in status that would affect your loan status (for example: loss of eligibility for unemployment deferment by obtaining a job). 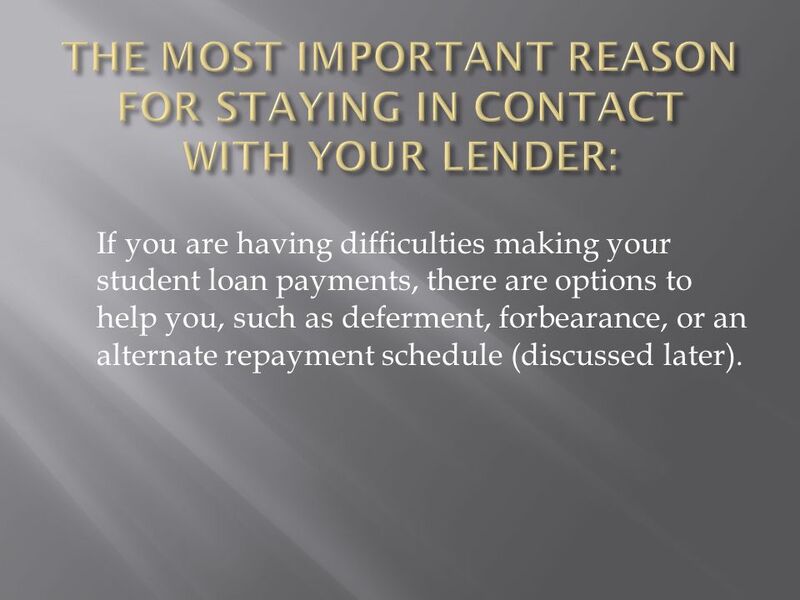 5 If you are having difficulties making your student loan payments, there are options to help you, such as deferment, forbearance, or an alternate repayment schedule (discussed later). 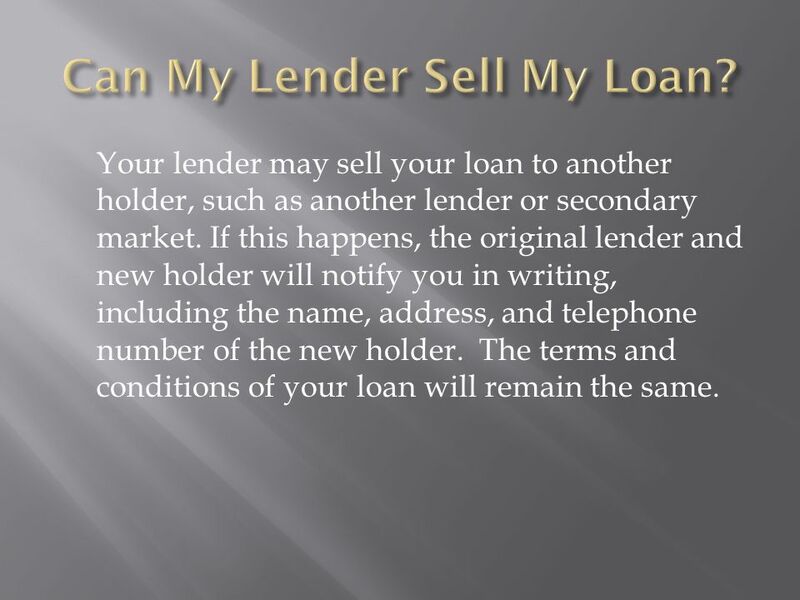 6 Your lender may sell your loan to another holder, such as another lender or secondary market. If this happens, the original lender and new holder will notify you in writing, including the name, address, and telephone number of the new holder. The terms and conditions of your loan will remain the same. 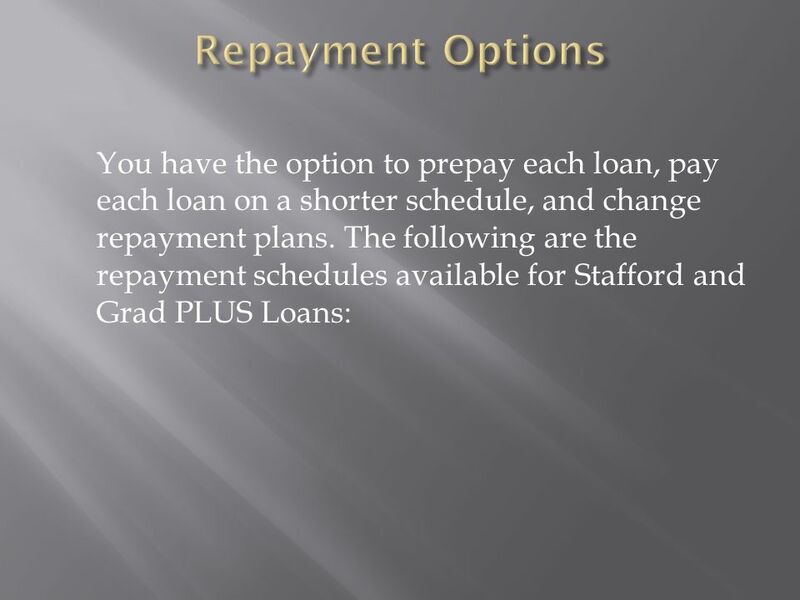 8 Stafford Loans (subsidized and unsubsidized) Your Stafford Loans will have a grace period of six months before you enter repayment. This grace period begins the day after you stop attending school at least half-time. 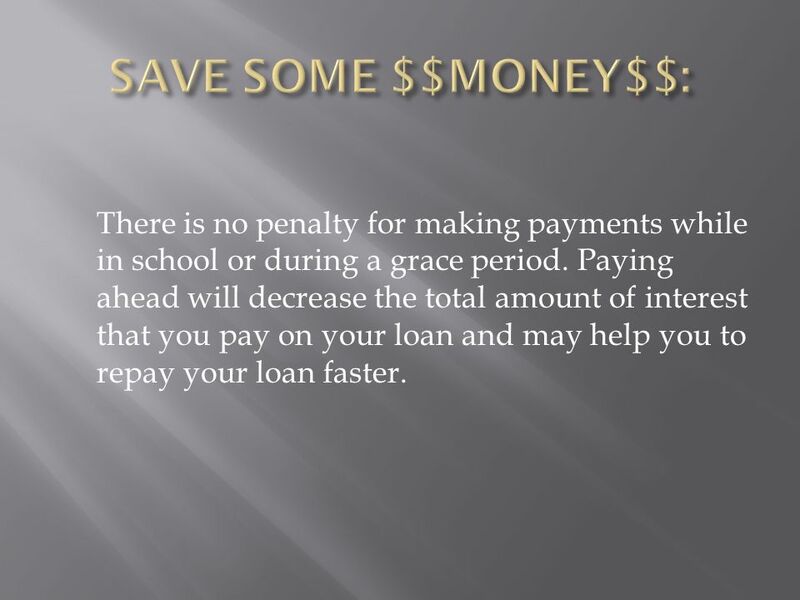 Each loan has only one six-month grace period. 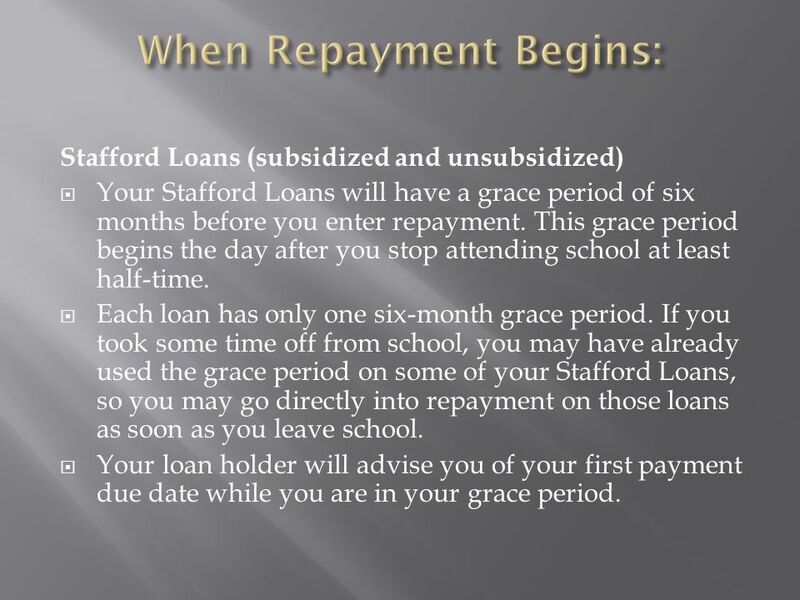 If you took some time off from school, you may have already used the grace period on some of your Stafford Loans, so you may go directly into repayment on those loans as soon as you leave school. Your loan holder will advise you of your first payment due date while you are in your grace period. 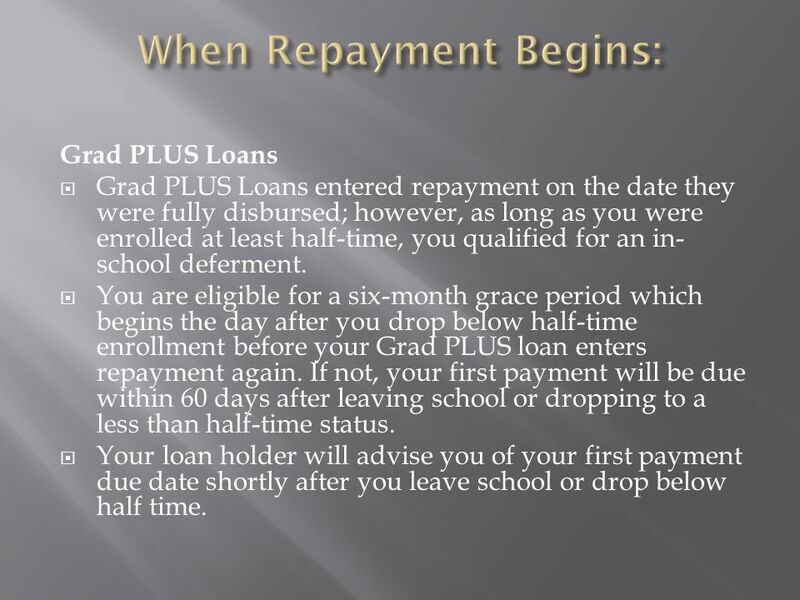 9 Grad PLUS Loans Grad PLUS Loans entered repayment on the date they were fully disbursed; however, as long as you were enrolled at least half-time, you qualified for an in- school deferment. 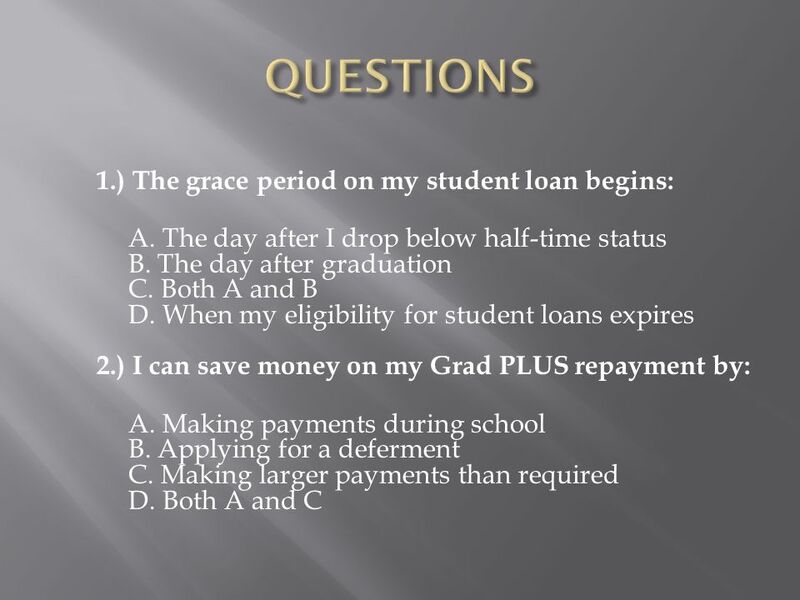 You are eligible for a six-month grace period which begins the day after you drop below half-time enrollment before your Grad PLUS loan enters repayment again. If not, your first payment will be due within 60 days after leaving school or dropping to a less than half-time status. Your loan holder will advise you of your first payment due date shortly after you leave school or drop below half time. 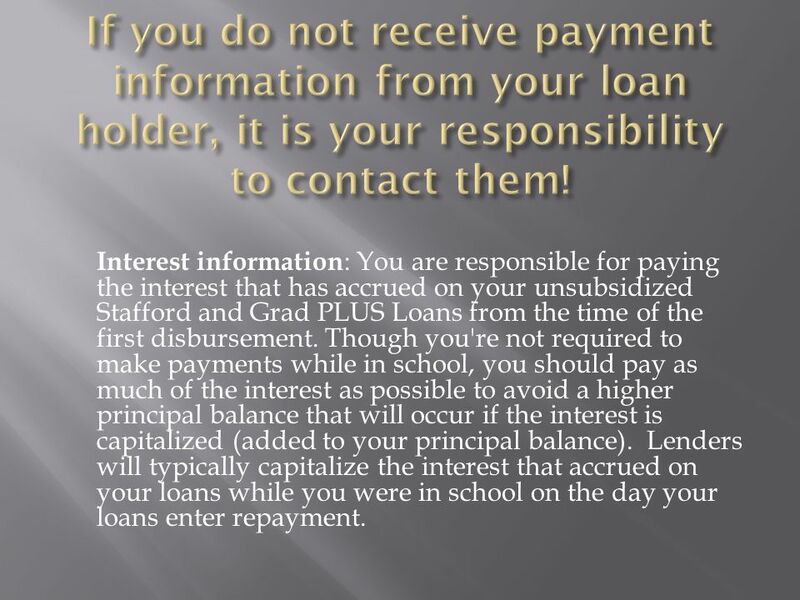 10 Interest information : You are responsible for paying the interest that has accrued on your unsubsidized Stafford and Grad PLUS Loans from the time of the first disbursement. Though you're not required to make payments while in school, you should pay as much of the interest as possible to avoid a higher principal balance that will occur if the interest is capitalized (added to your principal balance). Lenders will typically capitalize the interest that accrued on your loans while you were in school on the day your loans enter repayment. 11 There is no penalty for making payments while in school or during a grace period. Paying ahead will decrease the total amount of interest that you pay on your loan and may help you to repay your loan faster. 12 Make sure you have all your loan records organized. It is important that you keep all of your loan papers and correspondence. Keep copies of everything. Create a monthly budget Know the amount of your student loan payments. 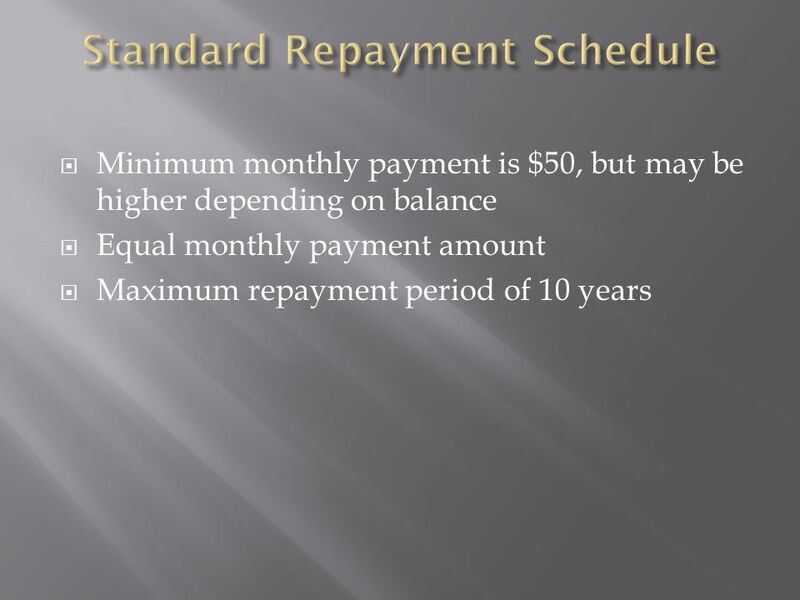 Your lender automatically arranges a standard repayment schedule, but will provide you with information about other options (discussed in the next topic). Make sure that you factor your student loan payments into your monthly budget. Check to see if your lender offers automatic payment withdrawal. This is an easy way to make sure your payments are made on time. Some lenders even lower your interest rate if you sign up for this option. You may be eligible to deduct up to $2,500 of the student loan interest you paid! Contact the IRS or a tax advisor for more information, or review IRS publication 970, "Tax Benefits for Education," available at www.irs.gov. 16 Begins with lower payment amounts that increase over time. 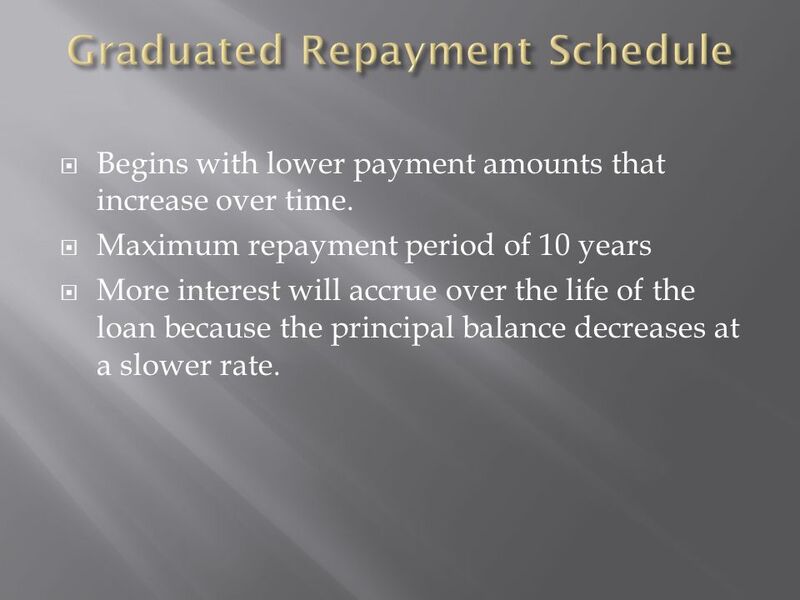 Maximum repayment period of 10 years More interest will accrue over the life of the loan because the principal balance decreases at a slower rate. 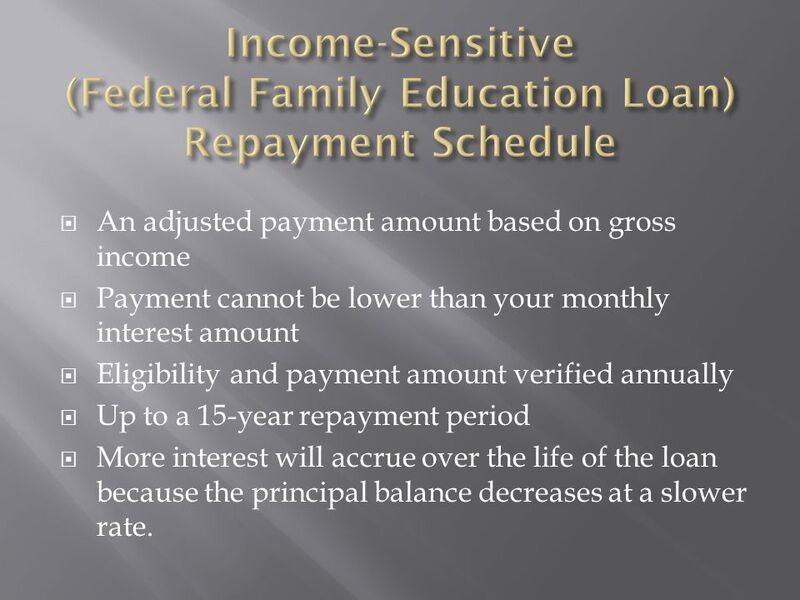 17 An adjusted payment amount based on gross income Payment cannot be lower than your monthly interest amount Eligibility and payment amount verified annually Up to a 15-year repayment period More interest will accrue over the life of the loan because the principal balance decreases at a slower rate. 18 An adjusted payment amount based on gross income and family size Eligibility and payment amount verified annually More interest will accrue over the life of the loan because the principal balance decreases at a slower rate. 19 Available for payments made on or after July 1, 2009 An adjusted payment amount based on income and family size Payment will not be more than 15 percent of the amount by which your adjusted gross income exceeds 150 percent of the poverty line for your family size If the monthly payment amount is not enough to pay accrued interest on a subsidized Federal Stafford Loan (or the subsidized portion of a Federal Consolidation Loan), the Department of Education will pay the remaining interest for a period of three years. Eligibility re-evaluated annually More interest may accrue over the life of the loan because the principal balance decreases at a slower rate. Any outstanding loan balance after 25 years will be forgiven Very few borrowers will have a remaining balance after 25 years. The amount that is forgiven may be taxable. 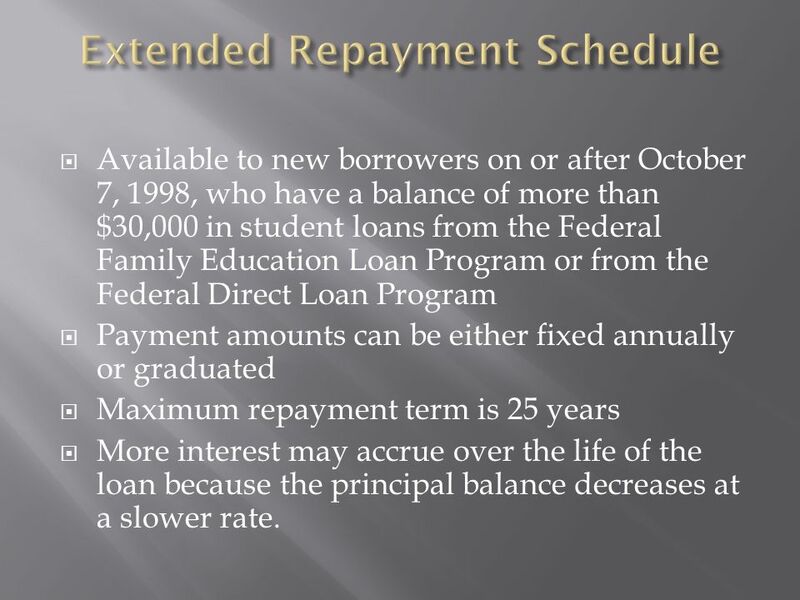 20 Available to new borrowers on or after October 7, 1998, who have a balance of more than $30,000 in student loans from the Federal Family Education Loan Program or from the Federal Direct Loan Program Payment amounts can be either fixed annually or graduated Maximum repayment term is 25 years More interest may accrue over the life of the loan because the principal balance decreases at a slower rate. 22 For specific questions about your payment amount, check with your loan holder. 24 Repaying your student loan is a VERY serious obligation. Remember, you are required to make your student loan payments even if you: do not complete your education, do not complete your program within the regular completion time for that program, do not find employment, or feel that the education you received did not meet your expectations. 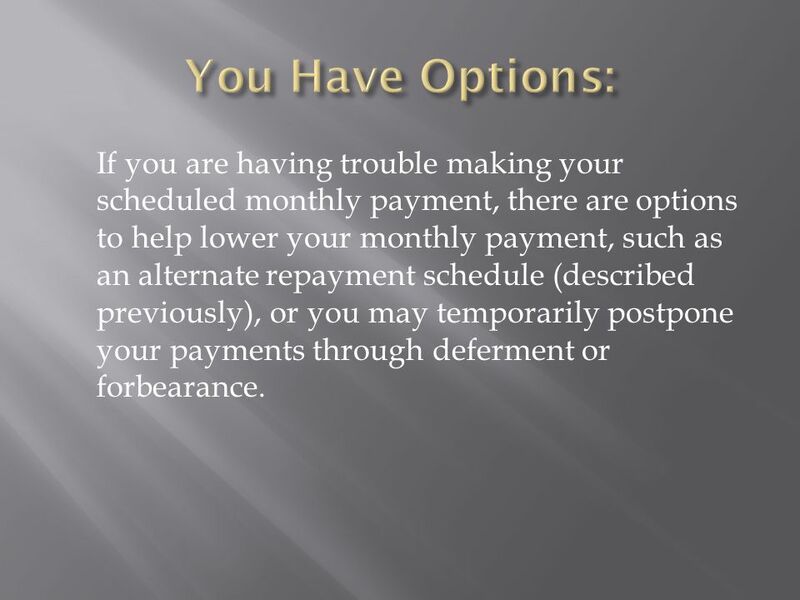 25 If you are having trouble making your scheduled monthly payment, there are options to help lower your monthly payment, such as an alternate repayment schedule (described previously), or you may temporarily postpone your payments through deferment or forbearance. 27 You are responsible for paying the interest that accrues on your unsubsidized Stafford Loans and your Grad PLUS Loans during all periods of deferment. 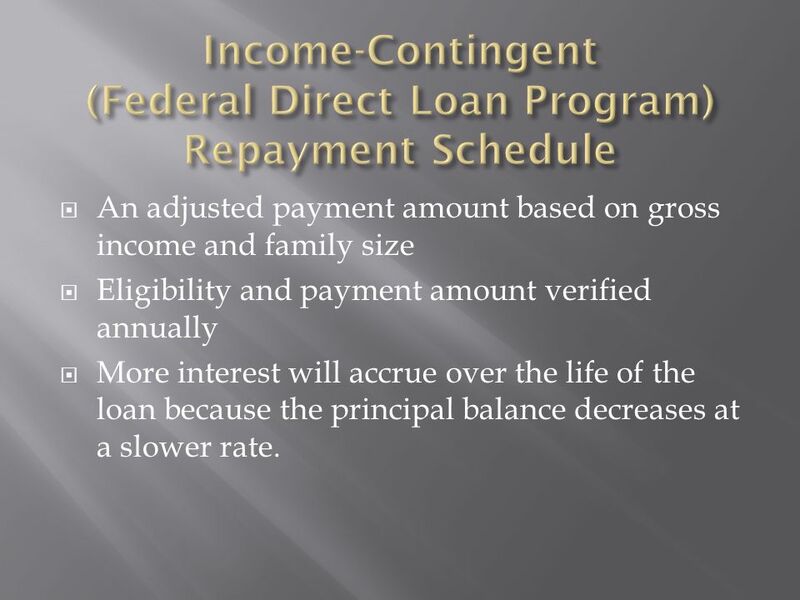 On subsidized Federal Stafford Loans the government pays the interest during deferment periods. The date on which you first received your oldest outstanding student loan determines your eligibility for deferments. 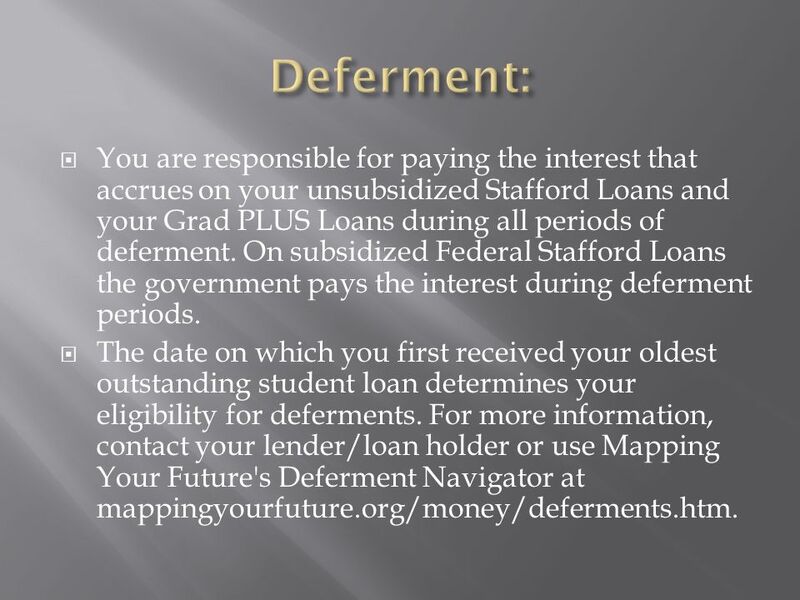 For more information, contact your lender/loan holder or use Mapping Your Future's Deferment Navigator at mappingyourfuture.org/money/deferments.htm. 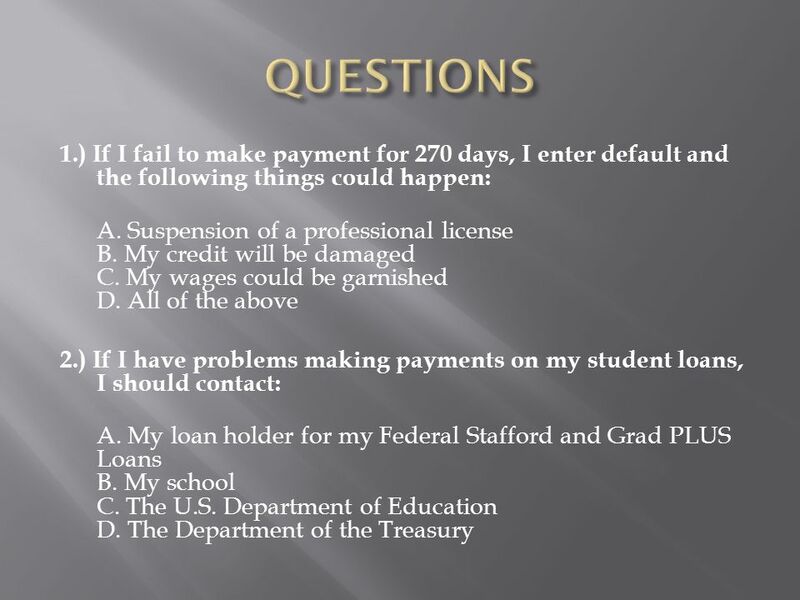 28 To request a deferment: contact your loan holder, submit the required documentation for the deferment, and continue making payments on your account while waiting for notification of approval. 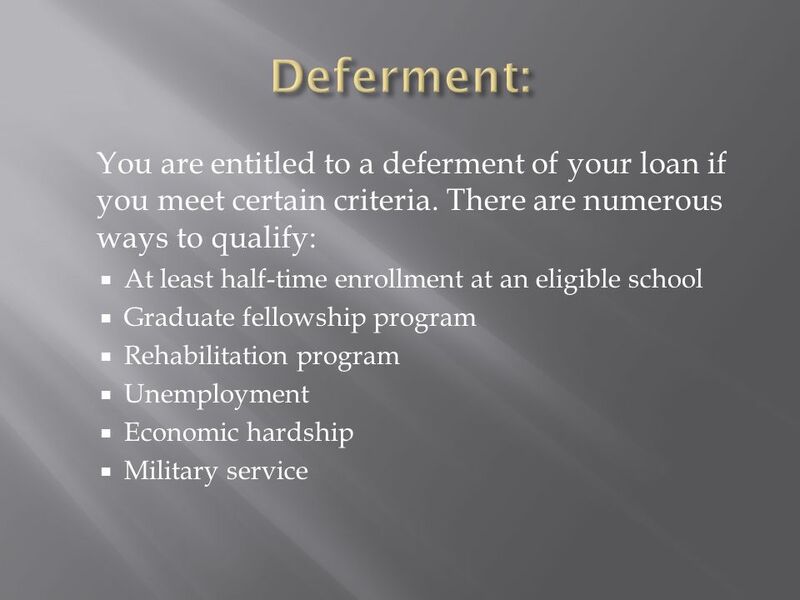 29 If you are unable to make your scheduled payments, but do not meet the criteria to qualify for a deferment, the loan holder may grant forbearance to allow you to: reduce the amount of your payment or temporarily stop making payments. 30 You must contact your loan holder to request forbearance. 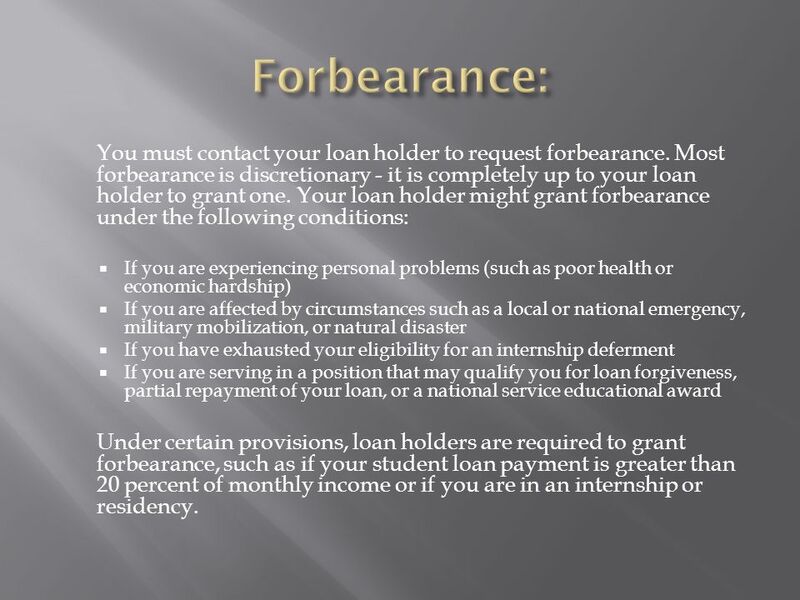 Most forbearance is discretionary - it is completely up to your loan holder to grant one. 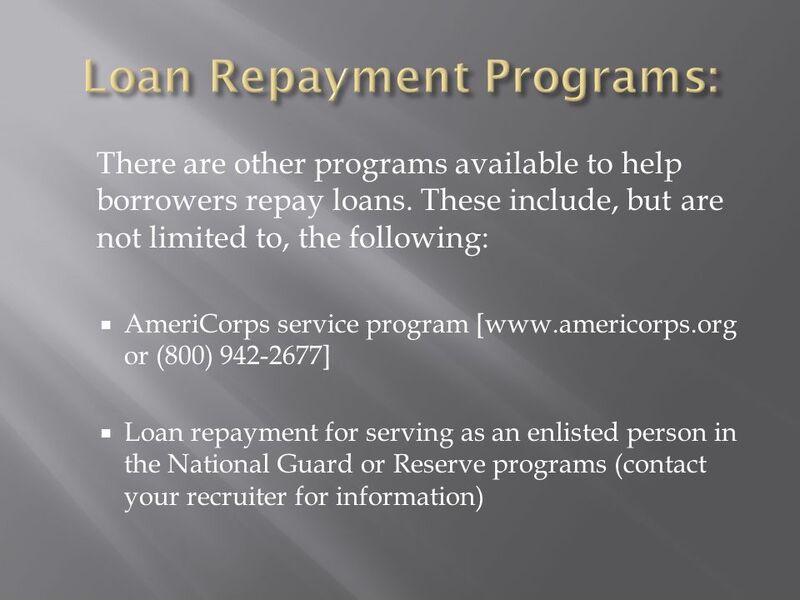 Your loan holder might grant forbearance under the following conditions: If you are experiencing personal problems (such as poor health or economic hardship) If you are affected by circumstances such as a local or national emergency, military mobilization, or natural disaster If you have exhausted your eligibility for an internship deferment If you are serving in a position that may qualify you for loan forgiveness, partial repayment of your loan, or a national service educational award Under certain provisions, loan holders are required to grant forbearance, such as if your student loan payment is greater than 20 percent of monthly income or if you are in an internship or residency. 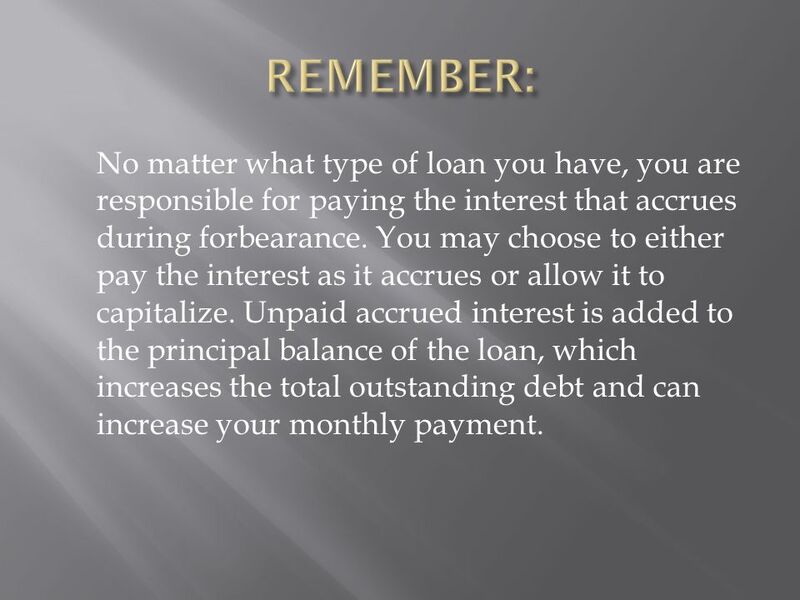 31 No matter what type of loan you have, you are responsible for paying the interest that accrues during forbearance. You may choose to either pay the interest as it accrues or allow it to capitalize. Unpaid accrued interest is added to the principal balance of the loan, which increases the total outstanding debt and can increase your monthly payment. 32 Deferments are entitlements. 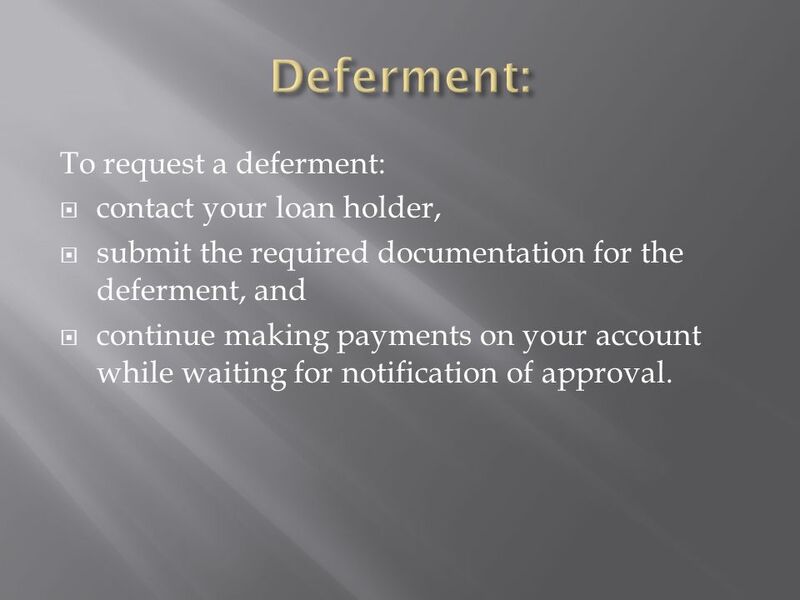 If you are eligible for a deferment, your lender must grant you one. However, you must fill out the proper forms and submit the required documentation to prove your eligibility. Forbearance is almost always discretionary. It is granted entirely at the lenders discretion. 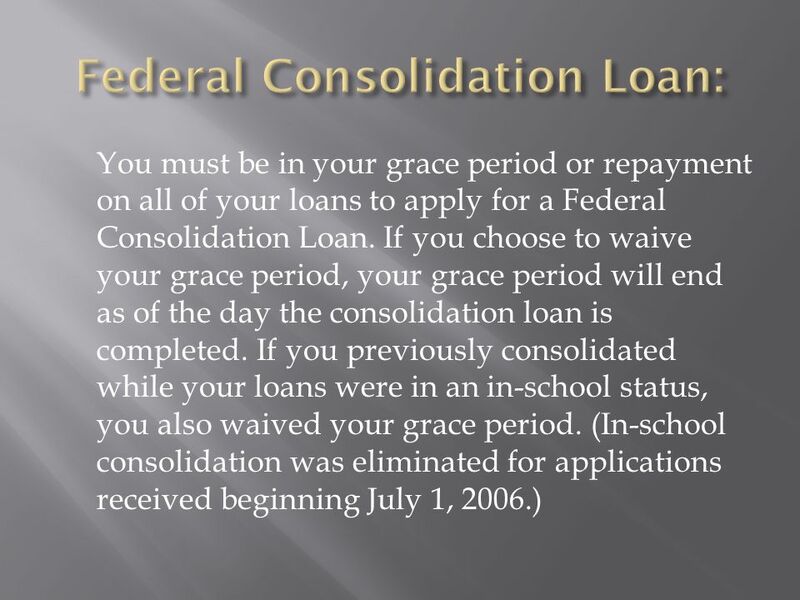 The federal government pays the interest that accrues on your subsidized Stafford loans during periods of deferment. You pay all interest that accrues during periods of forbearance. 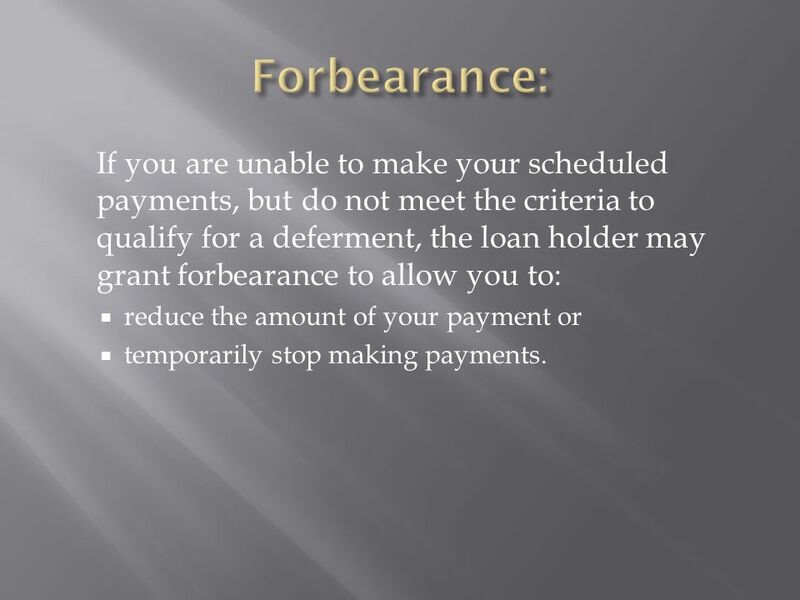 Both deferment and forbearance are useful options available to you if you are having difficulty making your monthly payments. 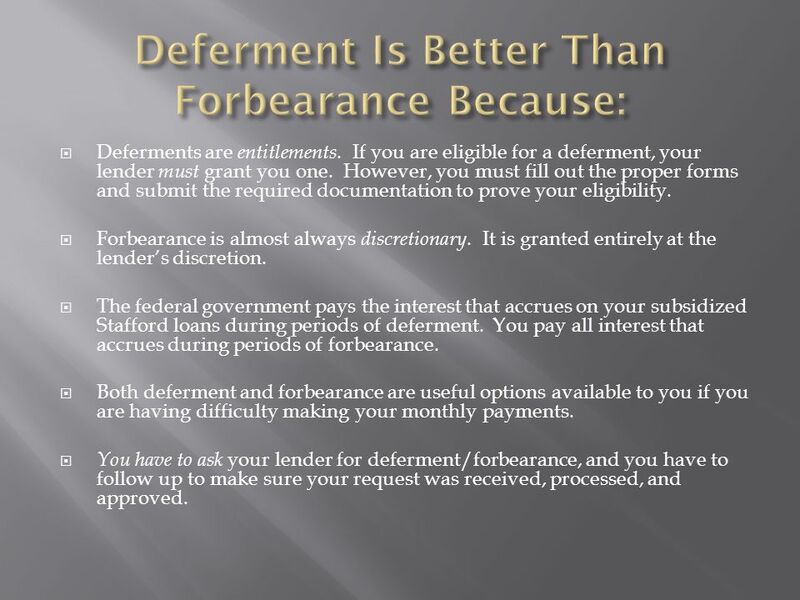 You have to ask your lender for deferment/forbearance, and you have to follow up to make sure your request was received, processed, and approved. 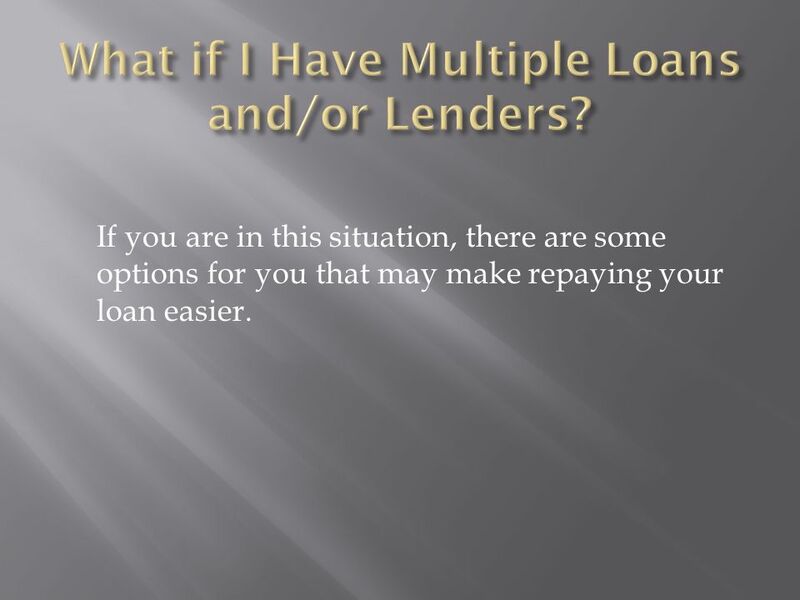 33 If you are in this situation, there are some options for you that may make repaying your loan easier. 34 This may be an option for you if you have multiple lenders or make minimum monthly payments on multiple loans. This may make it possible to have one monthly payment to one lender. 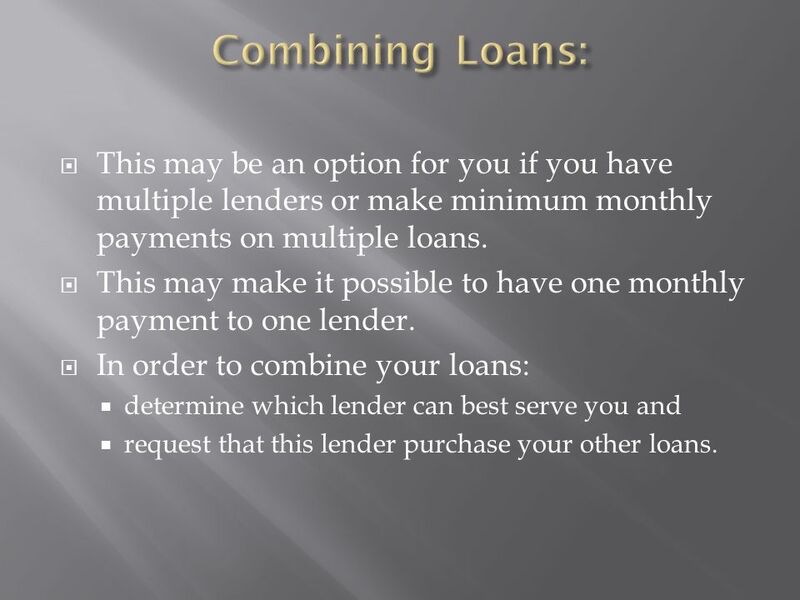 In order to combine your loans: determine which lender can best serve you and request that this lender purchase your other loans. 37 If you are interested in this type of loan, you should contact your lender/servicer to determine if it is in your best interest. If your lender/servicer does not provide Federal Consolidation Loans, they may be able to refer you to a lender who does. 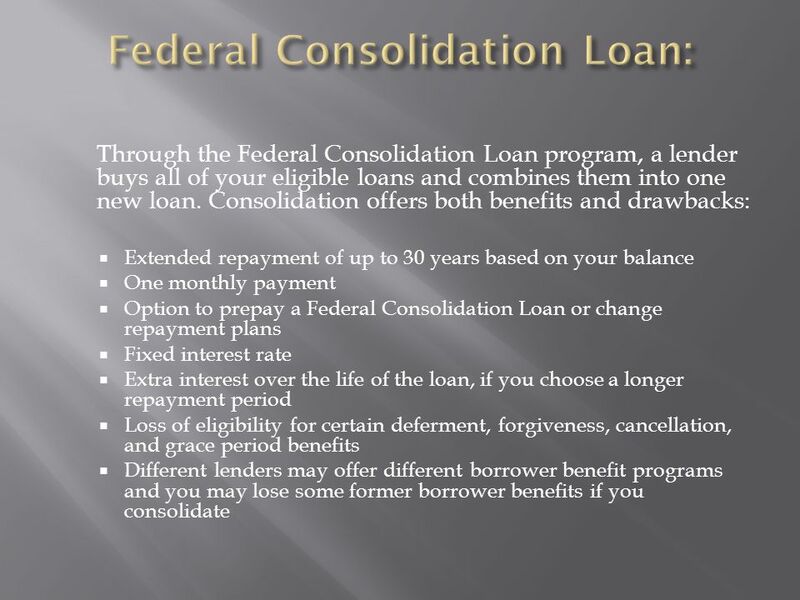 You can consolidate your loans with any lender that provides Federal Student Loan Consolidations. Before choosing which lender to consolidate with, it is a good idea to research multiple consolidation lenders and look for the best repayment incentives. 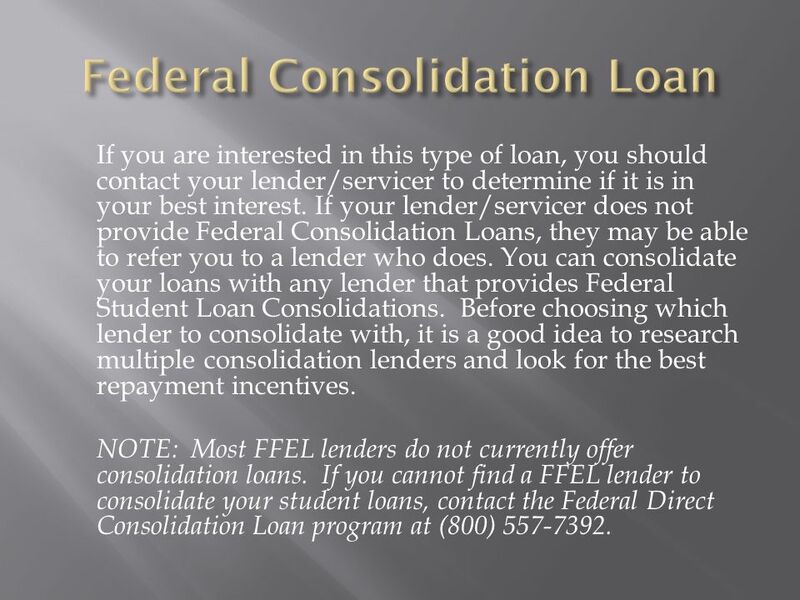 NOTE: Most FFEL lenders do not currently offer consolidation loans. 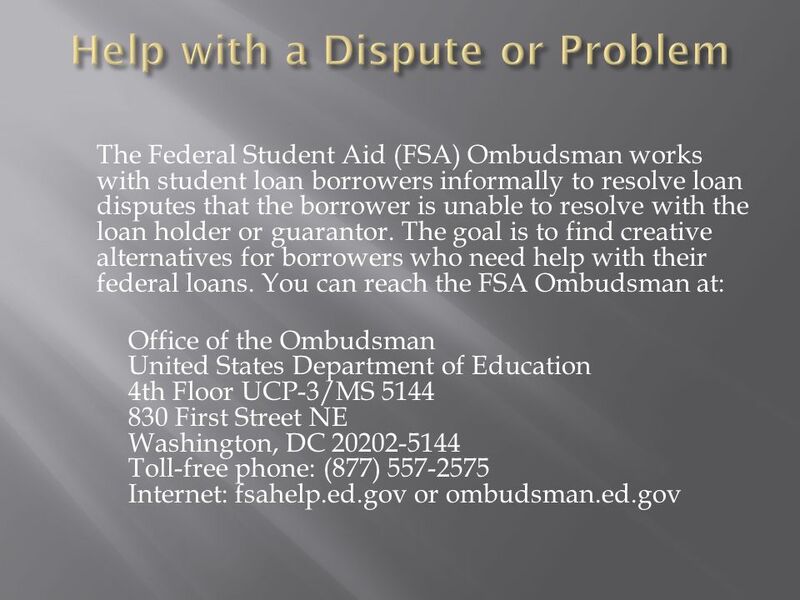 If you cannot find a FFEL lender to consolidate your student loans, contact the Federal Direct Consolidation Loan program at (800) 557-7392. 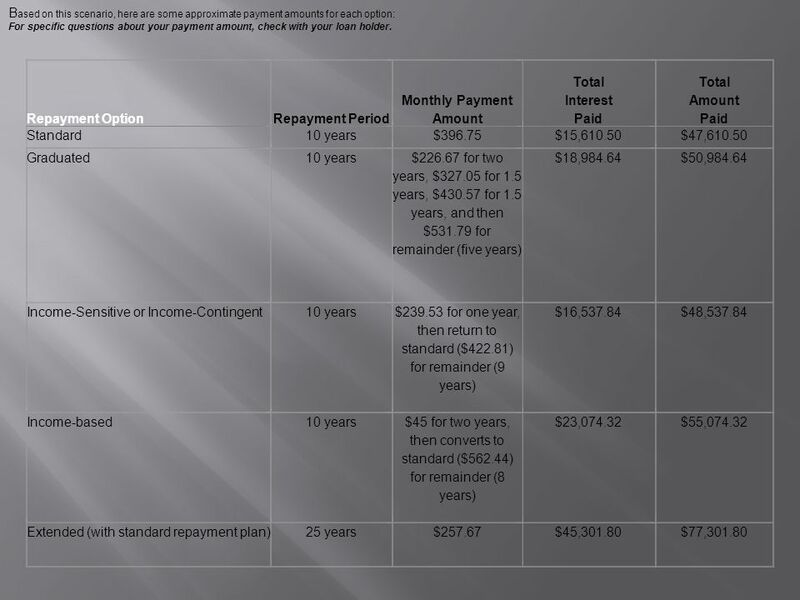 38 You have the following loans you're considering consolidating: Loan A: $2,625 balance, 4.13 percent interest Loan B: $3,500 balance, 5.2 percent interest Loan C: $5,500 balance, 6.1 percent interest Loan D: $5,500 balance, 6.8 percent interest If you consolidate these loans (a total of $17,125 ), you'll have 15 years (180 months) to repay your Consolidation Loan. The weighted average interest rate of the loans is 5.839 percent. This is rounded up to the nearest 1/8th of one whole percent, resulting in your fixed interest rate of 5.875 percent. 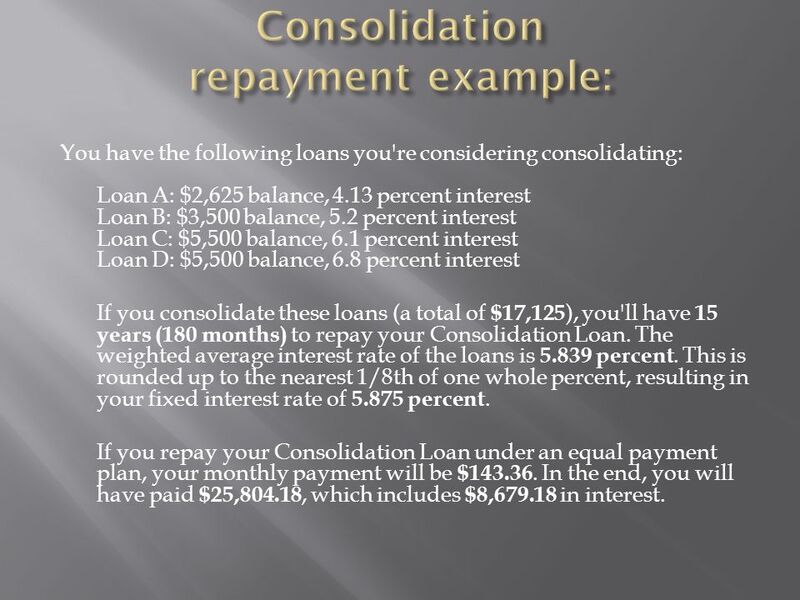 If you repay your Consolidation Loan under an equal payment plan, your monthly payment will be $143.36. 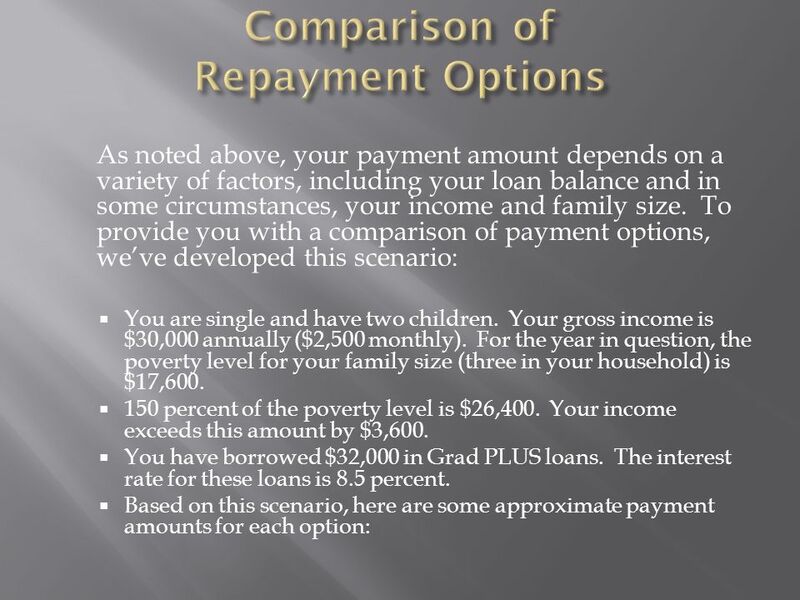 In the end, you will have paid $25,804.18, which includes $8,679.18 in interest. 40 You are generally obligated to repay your student loan, regardless of what happens. In fact, federal student loans usually are not even discharged or cancelled due to bankruptcy. 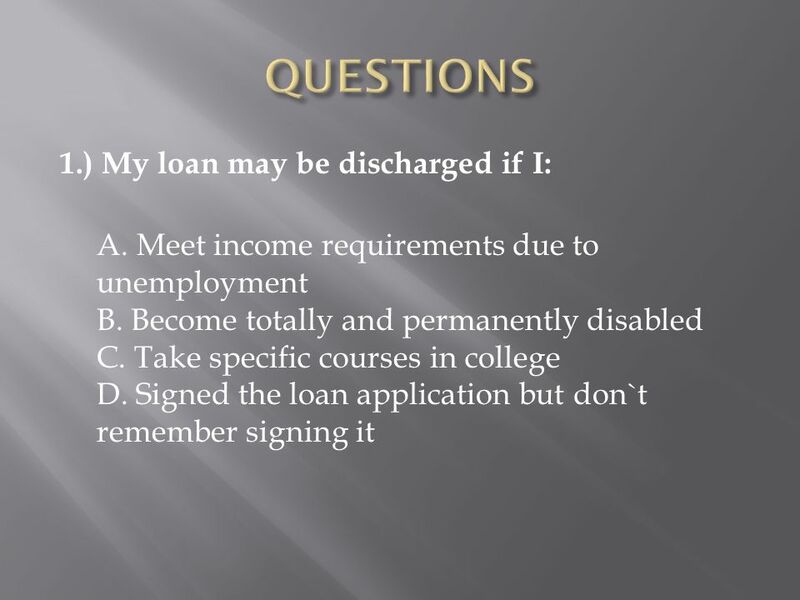 However, there are a few situations in which your loan may be cancelled: You die You are totally and permanently disabled (requires certification from a physician and is subject to a conditional period of three years) Your school fails to pay a refund if you withdraw You are unable to complete your program of study due to school closure Your loan was falsely certified as a result of identity theft Your school falsely certified or fraudulently completed a loan application in your name without your approval Contact your loan holder if you think you may be eligible. 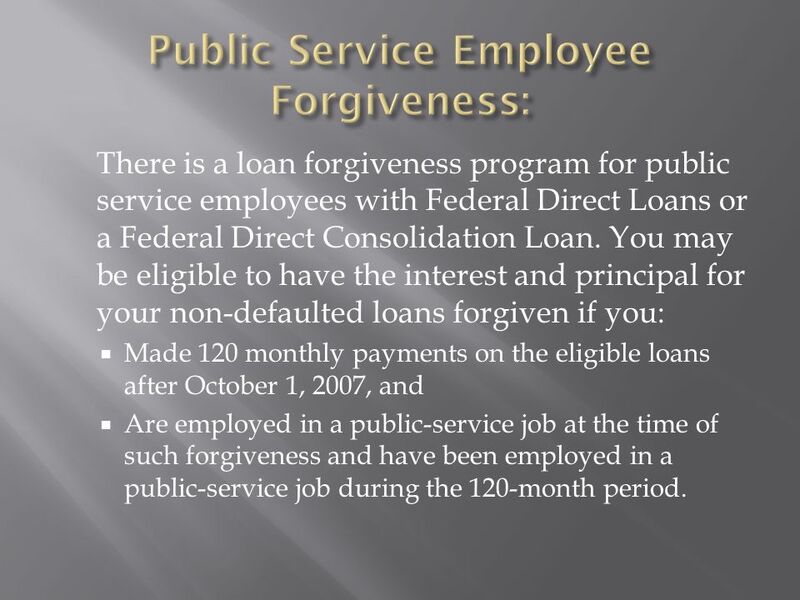 42 There is a loan forgiveness program for public service employees with Federal Direct Loans or a Federal Direct Consolidation Loan. 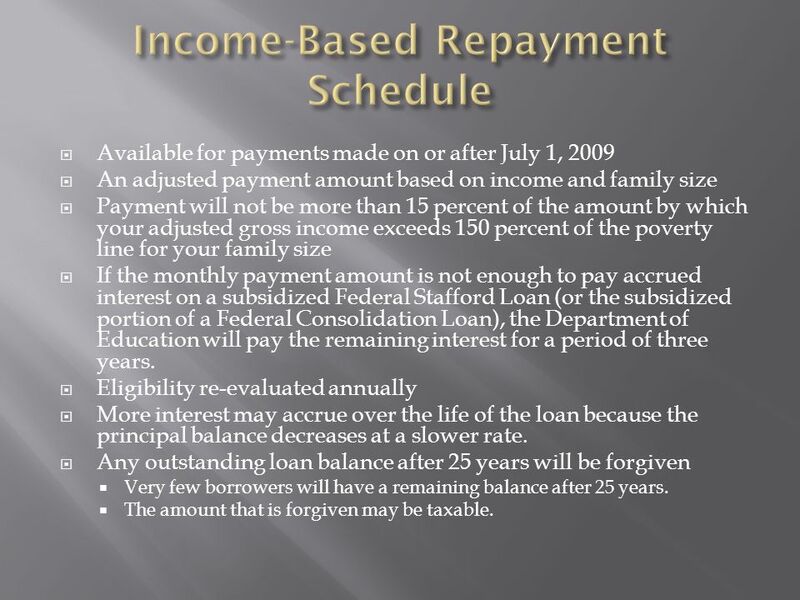 You may be eligible to have the interest and principal for your non-defaulted loans forgiven if you: Made 120 monthly payments on the eligible loans after October 1, 2007, and Are employed in a public-service job at the time of such forgiveness and have been employed in a public-service job during the 120-month period. 43 For each school, academic, or calendar year of full-time employment in an area of national need you complete on or after August 14, 2008, up to $2,000 of your outstanding student loan balance will be forgiven. No more than $10,000 total will be forgiven, and you shall receive no forgiveness for more than five years of service. See http://mappingyourfuture.org/paying/loanForgiveDetails.htm#nationalneed for more details. This program is subject to federal funding allocation and availability. 47 It is very important that you make your loan payments on time. If you are having trouble making your monthly payment, you should immediately contact your loan holder. There are options to assist you, but you must ask for assistance! 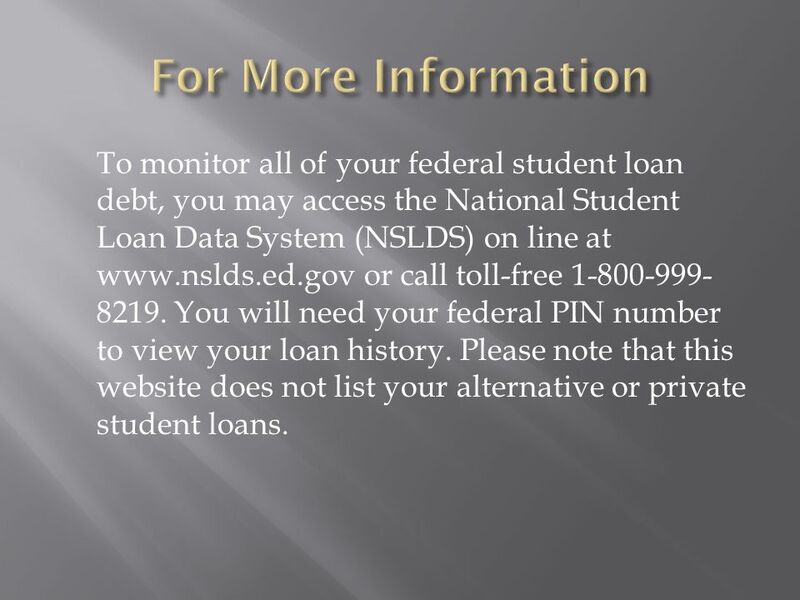 49 To monitor all of your federal student loan debt, you may access the National Student Loan Data System (NSLDS) on line at www.nslds.ed.gov or call toll-free 1-800-999- 8219. You will need your federal PIN number to view your loan history. Please note that this website does not list your alternative or private student loans. 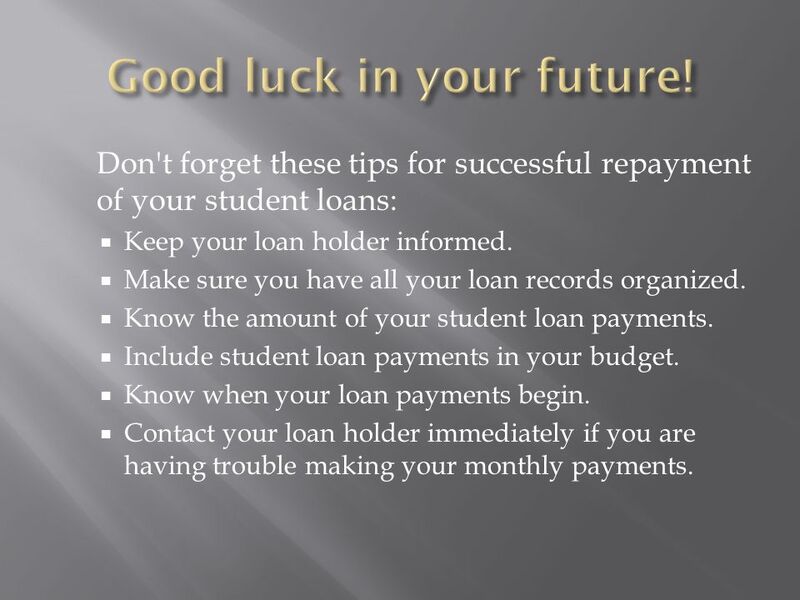 52 Don't forget these tips for successful repayment of your student loans: Keep your loan holder informed. Make sure you have all your loan records organized. Know the amount of your student loan payments. Include student loan payments in your budget. Know when your loan payments begin. Contact your loan holder immediately if you are having trouble making your monthly payments. 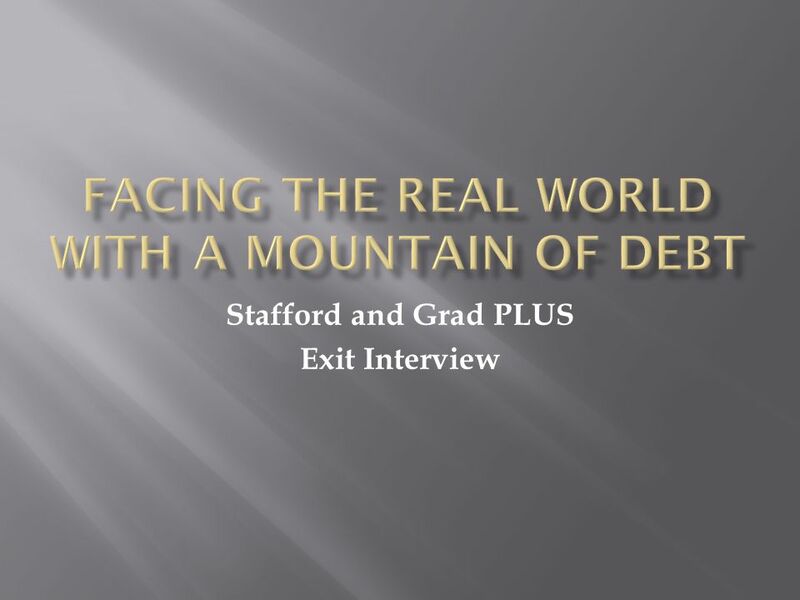 Download ppt "Stafford and Grad PLUS Exit Interview. Now that you are leaving school, it is important that you review your rights and responsibilities regarding your." Instructions This presentation provides you with tools and information to teach your students about money management and being responsible when borrowing. 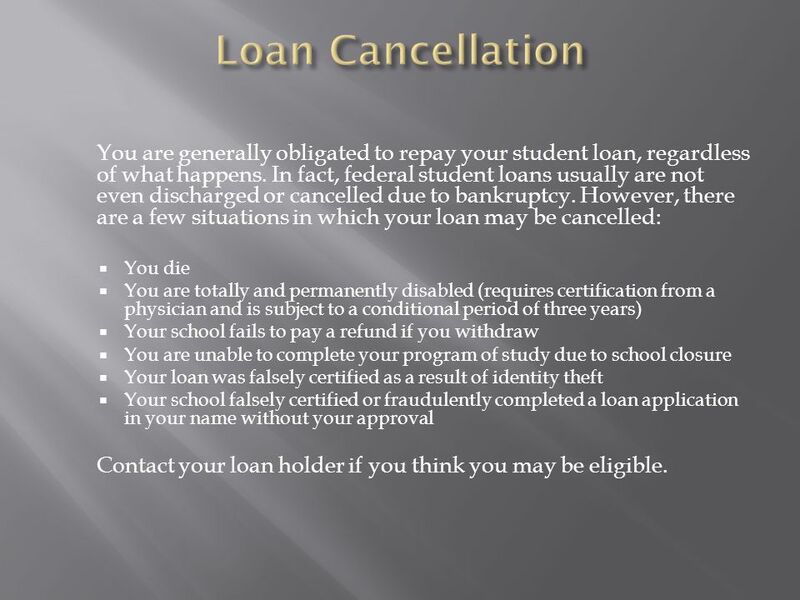 Loan Forgiveness, Cancellation & Discharge Debra Eddy, USA Funds Services. Graduate Student Exit Interview Northwestern University. 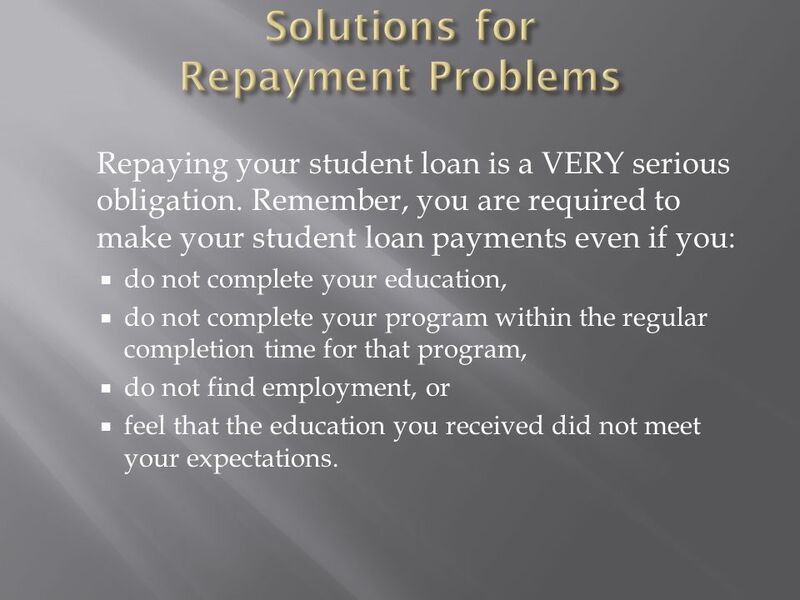 STUDENT LOAN REPAYMENT Presentation To WFAA Conference, October 2011. LAUREN JONES, M.A., NCC VIRGINIA TIDEWATER CONSORTIUM’S EDUCATIONAL OPPORTUNITY CENTER Managing Student Loan Debt. F.L.I.G.H.T. Financial Literacy for Graduate Health Students of Today The F.L.I.G.H.T. program is designed for University of Tennessee Health Science Center. Financial Aid and Loan Repayment for Graduate Students Dan Shannahan Assistant Director GVSU Financial Aid Office. 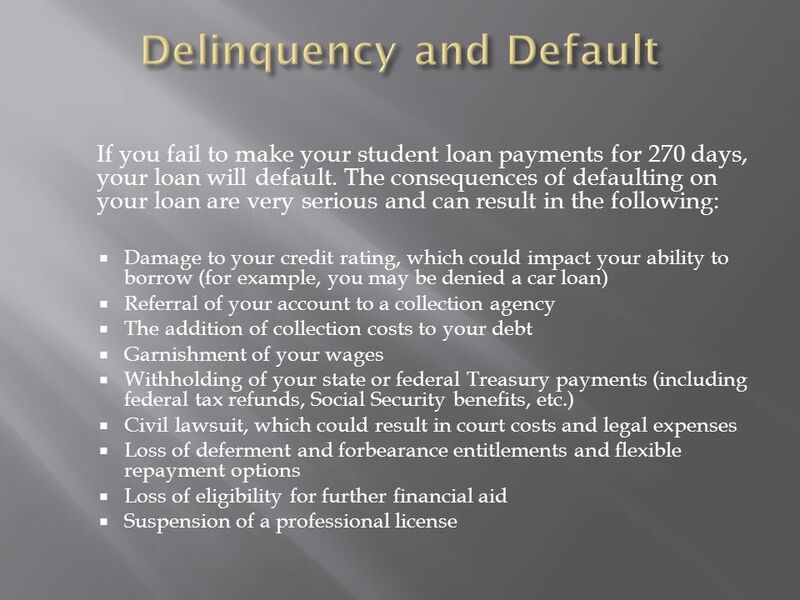 Overview of student loan repayment options Capital University Law School Managing Student Debt. 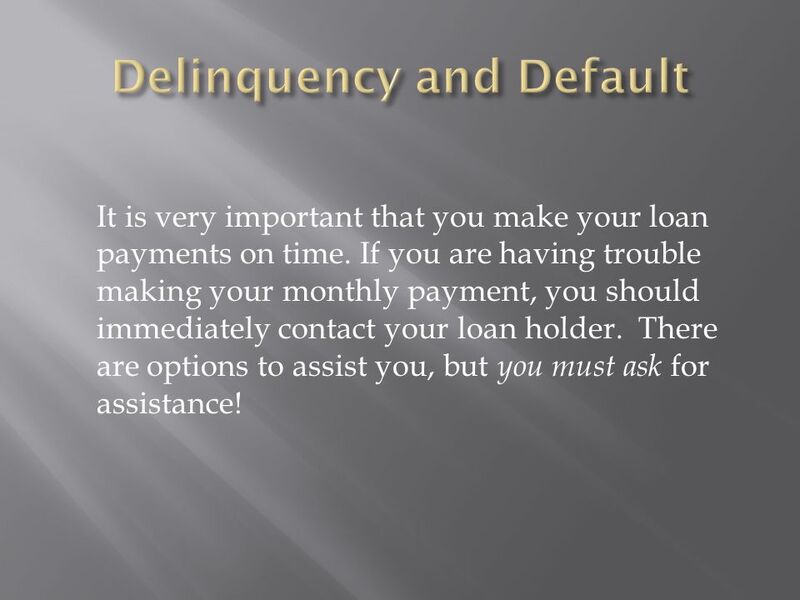 Loan Repayment, Exit Counseling Deferment and Forbearance. Loan Repayment Options Presented by: Kesha N Wilson & Malik Gladden Date: 5/20/2014 Event: VASFAA Annual Conference Norfolk State University. EXIT LOAN COUNSELING. 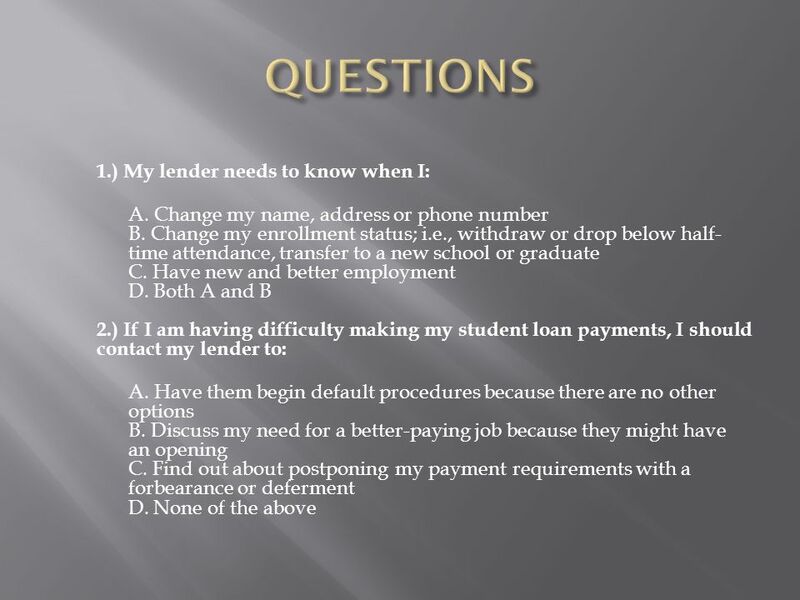 Things to Know Before you Go….. Know your Loans Repayment Options Loan Consolidation Deferment and Forbearance Loan Forgiveness. Sponsored by Welcome COUNTRY Financial® proudly provides financial literacy education to your classroom. Financial literacy is important, no matter how. Entrance Counseling. Agenda  Understand Your Commitment.  Your Loan Terms.  150 Percent Subsidized Direct Loan Limit.  Repayment.  Consequences. 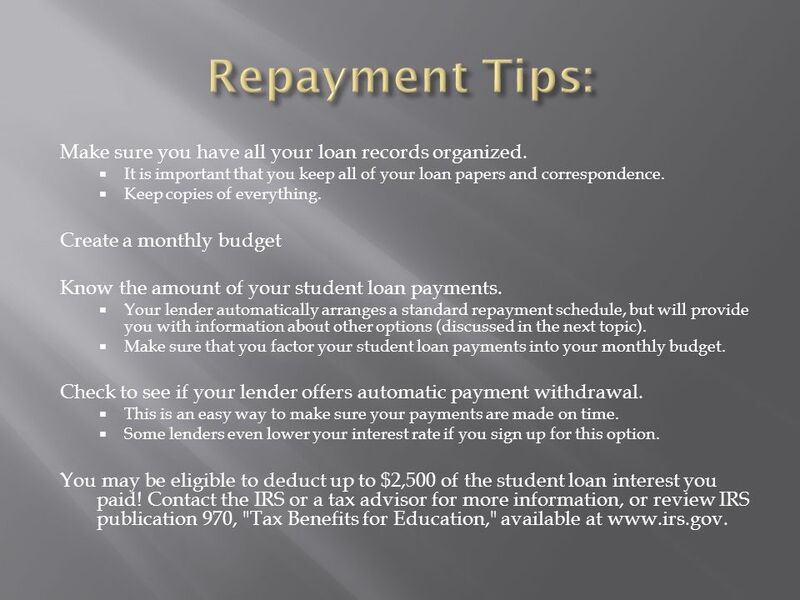 Repayment of Your Student Loan Debt 2014/2015 Office of Student Financial Assistance 1. ABC WORKSHOP 2012 LOANS. 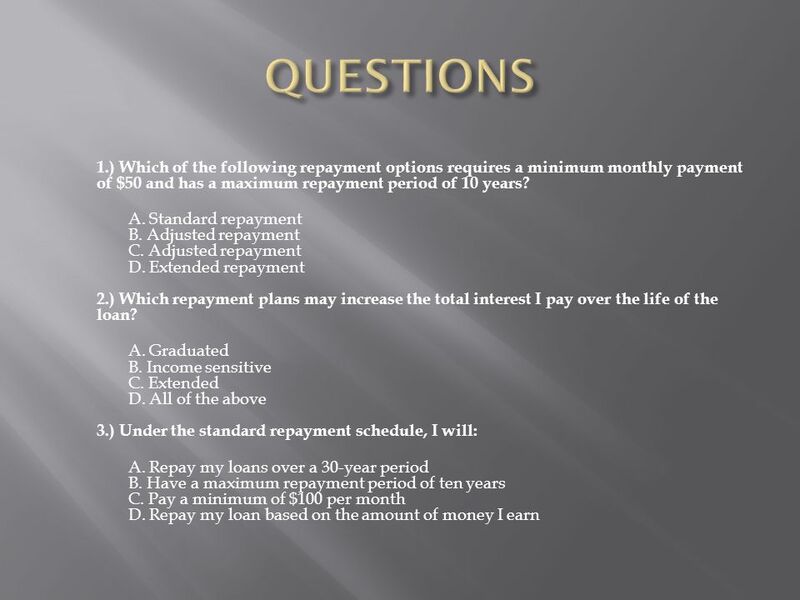 Types of Loans Loan Processes and Requirements Repayment Options. 2014 Financial Aid Exit Interview College of Dentistry College of Dentistry Class of 2014 University of Illinois at Chicago. 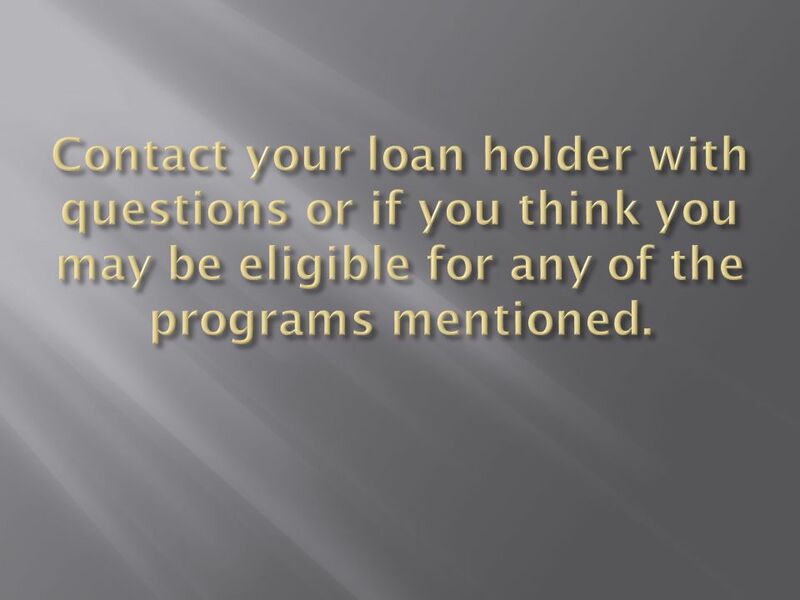 University of Wyoming – Delta Alpha Chapter Financial Literacy Student Loan Information. Financial Aid University of Akron Wayne College. What is financial aid? Any assistance used to reduce the amount you must pay Grants Loans Work-Study.